Charles W. Scharf was appointed Chief Executive Officer and a Director of BNY Mellon in July 2017 and became Chairman of the Board of Directors effective January 1, 2018. Charlie was most recently Chief Executive Officer and a Director of Visa Inc. from October 2012 through December 2016, where he was recognized for transforming the firm into a technology-driven digital commerce company. Before joining Visa, Charlie was a managing director of One Equity Partners, the private investment arm of JPMorgan Chase & Co. Previously, he served as Chief Executive Officer of Retail Financial Services, one of JP Morgan Chase’s six lines of business, from 2004 to 2011, and as Chief Executive Officer of the retail division of Bank One Corp. from 2002 to 2004. 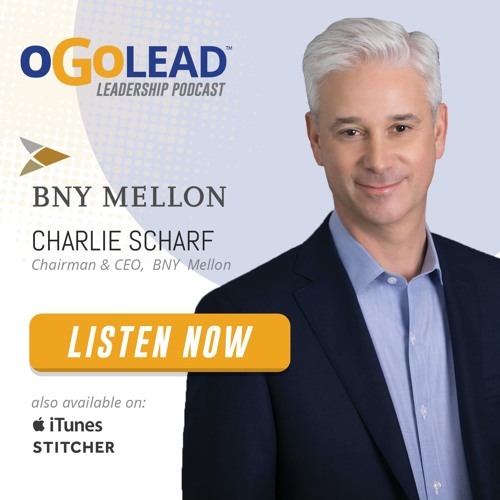 Charlie also served as CFO of Bank One Corp. from 2000 to 2002, CFO of the Global Corporate and Investment Bank division at Citigroup from 1999 to 2000, and CFO of Salomon Smith Barney and its predecessor company from 1995 to 1999. Charlie is on the Board of Directors of Microsoft Corporation. He is also a member of the Business Council, on the Board of Trustees for Johns Hopkins University and is Chairman of the New York City Ballet. Charlie holds a Bachelor of Arts degree from Johns Hopkins University and an MBA degree from New York University.